The possible dynamics of the electron beam, formed in the vicinity of Io, the natural satellite of Jupiter, and injected toward Jupiter, has been investigated analytically. When a beam penetrates the Jupiter plasma to a certain depth, the beam-plasma instability can be developed. In this case, the distribution function of electrons is expanded additionally by excited oscillations. These electrons, when their energy is of order of a required certain value, cause UV polar light. For closing of a current, the formation of a double electric layer is necessary. The necessary parameters and conditions for the formation of a double layer with a large jump of an electric potential at a certain height have been formulated, its properties, stability, behavior over time and beam reflection in its field for closing of a current have been described. Reflection of the beam can lead to its vortex dynamics. Gladstone G.R., Waite J.H., Grodent Jr,D. et al. A pulsating auroral X-ray hot spot on Jupiter // Letters to nature. NATURE. – 2002. –Vol. 415. – P. 1000 - 1003. Clarke J.T., Ajello J., Ballester G. et al. Ultraviolet emissions from the magnetic footprints of Io, Ganymede and Europa on Jupiter // Nature. – 2002. – Vol. 415. – P. 997–1000. Connerney J.E.P. et al. Images of excited H+ 3 at the foot of the Io flux tube in Jupiter's atmosphere // Science. –1993. –Vol. 262. – P. 1035–1038. Clarke J.T. et al. Far-ultraviolet imaging of Jupiter's aurora and the Io “footprint” // Science. –1996. –Vol. 274. –P. 404–409. Prangé R.et al. Rapid energy dissipation and variability of the Io–Jupiter electrodynamic circuit // Nature. –1996. –Vol. 379. – P. 323–325. Goldreich P., Lynden-Bell D. Io, a Jovian unipolar inductor // Astrophys. J. – 1969. – Vol. 156. – P. 59–78. Belcher J.W. The Jupiter–Io connection, an Alfven engine in space // Science. –1987. – Vol. 238. – P. 170–176. Neubauer F.M. Nonlinear standing Alfven wave current system at Io: theory // J. Geophys. Res. – 1980. – Vol. 85. – P. 1171-1178. Mauk B.H., Haggerty D.K., Paranicas C. et al. Discrete and broadband electron acceleration in Jupiter’s powerful aurora // Nature. – 2017. – Vol. 549. – P. 66–69. Dunn W.R., Branduardi-RaymontG., Ray L.C. et al. The independent pulsations of Jupiter’s northern and southern X-ray auroras // Nature. Astronomy. – 2017. – Vol. 1. – P. 758–764. Jacobsen S., Saur J., Neubauer F.M., Bonfond B., Gérard J. C., Grodent D. Location and spatial shape of electron beams in Io’s wake // Journal of Geophysical Research. – 2010. – Vol. 115. – P. A04205. Fomin P.I., Fomina A.P., Mal’nev V.N. Superradiation of magnetized electrons and the power of decameter radiation of the Jupiter – IO system // Ukrayins'kij Fyizichnij Zhurnal. – 2004. – Vol. 49. – No.1. – P. 3-8. Onishchenko I.N., Linetskii A.R., Matsiborko N.G., Shapiro V.D., Shevchenko V.I. 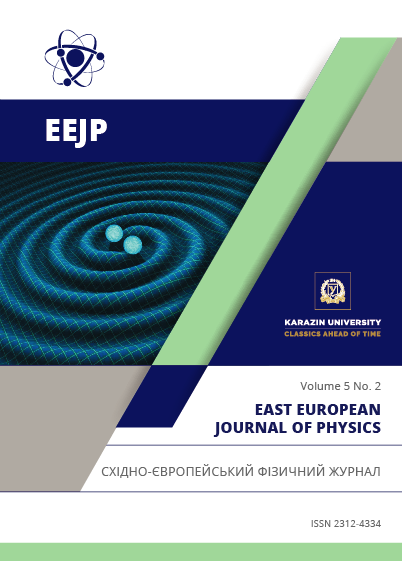 Contribution to the Nonlinear Theory of Excitation of a Monochromatic Plasma Wave by an Electron Beam // ZhETF Pis’ma v Redaktsiiu. – 1970. – Vol. 12. – No.12. – P. 407 – 411. Mikhailovsky A.B. Theory of plasma instabilities Vol. 1. – M.: Atomizdat, 1975. – P. 272. Singh N., Schunk R.W. Plasma response to the injection of an electron beam // Plasma Phys. and Contr. Fus. – 1984. – Vol. 26. – No.7. – P. 359 – 390. Maslov V.I. Double layer formed by relativistic electron beam // Plasma Physics and Fusion Technology. – 1992. – Vol. 13. – No.10. – P. 676-679. Okuda H., Horton R., Ono M., Ashour-Abdalla M. Propagation of nonrelativistic electron beam in a plasma in a magnetic field // Phys. Fluids. – 1987. – Vol. 30. – No.1. – P. 200 - 203.